We attach very great importance to optimally selecting the studs when breeding our Clydesdales. Topmost priority is health and usability of the horses. Representativeness and size are not everything. Besides, the foals should be uncomplicated in their temperament and easily manageable. Such characteristics are also contributed essentially by the studs. All our breeding studs are very easy to manage and show very normal social behaviours. Of course, we also try to breed aesthetically appealing horses, and this should surely go without saying! At 1.85m, Dillars Ideal is a very tall, attractive stallion (and he knows it! ), with exemplary social behaviour. He has been ‘broken-in’ and is completely unproblematic to handle. He passes on his markings nicely which results in very attractive foals. Schumann’s Kaleidoscope is a modern, relatively light Clydesdale stallion with a very exclusive and much sought after colour, which is passed on to some extent to his offspring. 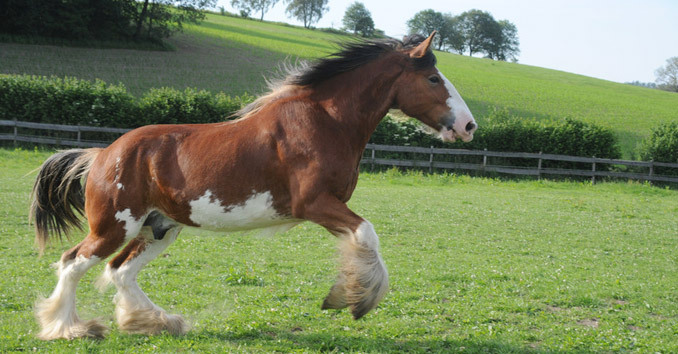 A classical and traditional Clydesdale stallion with a wonderfully full feathering.